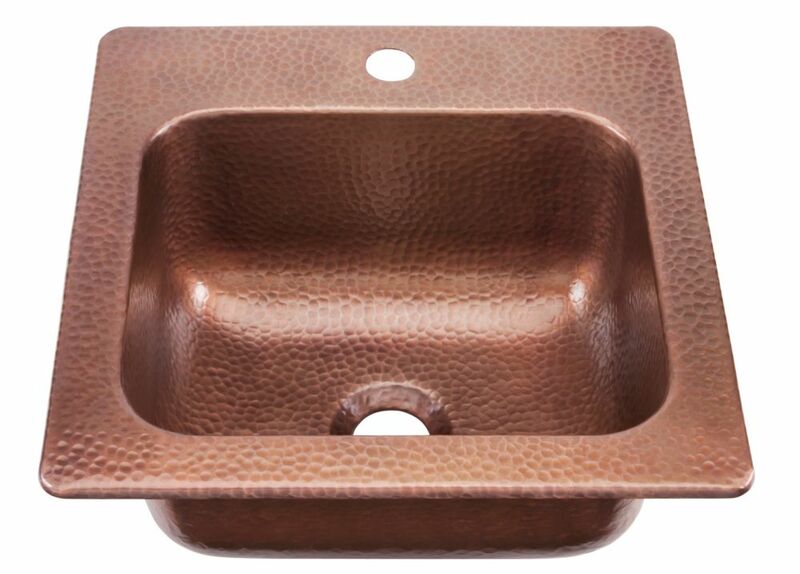 The Seurat copper sink is handcrafted from 16 Gauge puresolid copper and designed to be easy to install. Sinkology handcrafts each sink using only the purest copper available. The drop-in design is functional, beautiful and easy to install. Featuring a single hole faucet deck and standard 2" in. drain hole replacing your old bar sink with a copper sink is effortless. Crafted from the finest Pure Solid Copper available. Indulge in the ultimate performance of the functional, sleek and colourful BLANCO PERFORMA collection. PERFORMA kitchen, bar and prep sinks are made from patented SILGRANIT. material known for its Strength, Durability and Beauty. Exclusive to Blanco, with several decades of development and manufacturing expertise, SILGRANIT. is Canada's leading coloured sink choice. Proudly made in Canada. Made of premium stainless steel and featuring Blanco's signature brushed satin finish, this sink offers timeless beauty and unmatched quality. Ideal as a secondary or island sink. The rear-positioned drainhole maximizes under-counter space while tight bowl corners maximize usable bowl space. At Sinkology we understand purchasing a coordinating faucet for your copper sink can be a challenge. Faucets with a bronze finish vary so much making the buying process complicated. By partnering with Pfister our design teams have handpicked the perfect faucet style / finish to complement your copper sink. We feel the Pfister Rustic bronze is the perfect color and quality to pair with a Sinkology kitchen sink. Not only do our design kits include high quality Rustic Bronze Pfister faucets, we have also included Sinkology accessories used for installation and maintaining your beautiful sink. The Rockwell farmhouse design kit includes a Pfister pull-down rustic bronze faucet, custom made vinyl coated brown bottom grid, copper armor care kit and two hand finished drains. One disposal flange and one basket strainer drain. At Sinkology we understand purchasing a quality faucet for your copper sink can be a challenge. Bronze faucet finish can vary so much, making the buying process complicated. By partnering with Pfister our design teams have handpicked the perfect faucet style and finish to complement your kitchen sink. We feel the Pfister Rustic bronze is the perfect colour and quality to pair with a Sinkology kitchen sink. Not only do our design kits include a luxurious copper sink and high quality Pfister faucet, we also include Sinkology accessories used for installation and maintenance. The Chef Series David undermount kitchen sink combo includes a Pfister pull-down rustic bronze faucet, custom made brown bottom grid, copper armour care kit and ISE disposal drain for easy installation. Pfister and Sinkology also protect all our products included with a Lifetime Warranty. Seurat Drop In Handmade Pure Solid Copper 15 in. 1-Hole Bar Prep Copper Sink in Antique Copper The Seurat copper sink is handcrafted from 16 Gauge puresolid copper and designed to be easy to install. Sinkology handcrafts each sink using only the purest copper available. The drop-in design is functional, beautiful and easy to install. Featuring a single hole faucet deck and standard 2" in. drain hole replacing your old bar sink with a copper sink is effortless. Seurat Drop In Handmade Pure Solid Copper 15 in. 1-Hole Bar Prep Copper Sink in Antique Copper is rated 4.6 out of 5 by 15. Rated 5 out of 5 by Happyorder from Looks very classy. Added the Pfister faucet in bronze that was recommended and it is a lovely se... Looks very classy. Added the Pfister faucet in bronze that was recommended and it is a lovely set. Plumbers had no problem with installation which was quick and not very costly. Overall, a great improvement. Rated 5 out of 5 by Kc from This sink is so pretty . Great update to my... This sink is so pretty . Great update to my bar sink. Rated 4 out of 5 by 970shrink from The sink itself is beautiful and well made. I replaced a very old stainless sink with this and a... The sink itself is beautiful and well made. I replaced a very old stainless sink with this and an elegant faucet set on a rust colored tile counter top. Sink and faucet set look quite lovely. My only gripe with the sink was the lack of clear instructions as to how to proceed with the drain installation. The instructions are pretty and nicely designed but do not make clear the use of the supplied rubber washer. There is no clear text and the stylized graphics, while pretty, don't show the needed detail. Rated 5 out of 5 by Myrna from Love it, its pretty and easy to clean! Love it, its pretty and easy to clean! When I bought this sink i hoped it had the drain assembly included. Not so lucky. My issue is, when I go back to purchase the copper drain assembly Home Depot lists only a 3.5&quot; drain and this sink has a 2&quot; drain. What drain assembly am I to use? I spoke to the manufacturer...though they make a sink with a 2&quot; drain, they DO NOT make a drain to fit this sink.